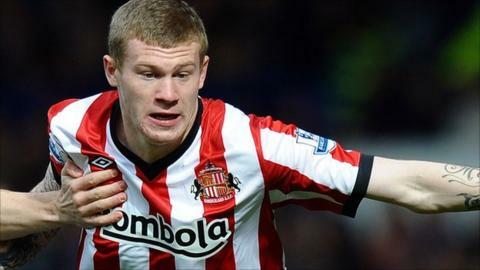 Sunderland winger James McClean has signed a new three year deal that will keep him at the Stadium of Light until the summer of 2015. The 22-year-old has emerged as a regular in the Black Cats first team since the arrival of Martin O'Neill in December, with four goals in 19 games. "I'm really enjoying my football and to have earned a new contract is a dream," McClean said. "I'm over the moon to see my next three years with Sunderland." McClean, who made his full Republic of Ireland debut against the Czech Republic last month, was signed by former boss Steve Bruce from hometown club Derry City last August. However it was not until Bruce was replaced by O'Neill that the winger was handed his debut, coming on as a substitute in December's 2-1 home win against Blackburn Rovers. "I am absolutely delighted that James has committed himself to the club," O'Neill said. "He has had an explosive start to his career here at Sunderland and long may it continue."